This next style challenge idea came from Polyvore. Yes! A really fascinating, fancy and almost mandatory tool for all you blog writers and stylists out there! You’ll have to agree that Polyvore can inspire and at the same time help you document some fabulous style ideas. And for those who don’t know what I’m talking about, I insist you have a look at it straight after you read this post but don’t blame me if you get sucked into the fascinating world of Polyvore! A refreshing Spring look featuring an elegant yellow and white combination is what drew me to it in the first place. I recreated the look with the pieces that already existed in my wardrobe and just refined some of the accessories to give it a polished touch. It’s amazing how you can end up getting a completely fresh and stylish look just by pairing pieces you’ve probably never teamed up in the past. And I’ve turned to Polyvore for ideas on so many occasions not just for myself but also for the readers who approach me with their fashion queries. For a reader: Going shopping! What do I wear? Love the whole look. The top is so cute. Really like your outfit.I have same kind of top .I wasnt sure to wear with ? I have yellow Tights from Susan will try to see and will send u pix .Thanks for inspiring. 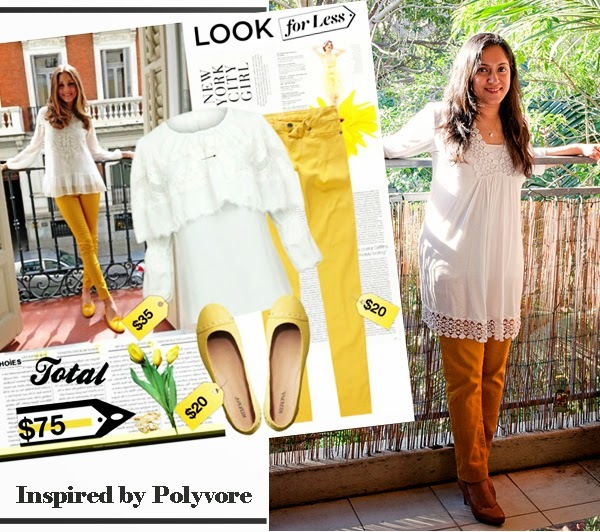 I love the pairing of the white tunic with the yellow jeans and the detailing on the tunic. Olivia Palermo herself is so versatile when it comes to style. Love how you accessorized too! i lvoe the whole outfit..the colours are very spring (even though it is actually autumn) it reminds me of holi and saraswati puja..
WOW..KAlyani..u look beautiful..u wudn’t believe..i m wearing the exact same outfit today..n i love it so much. I love ur heels too. Simply fab. Thnx for commenting on my latest post. Appreciate it. WOW..u look so beautiful..i m in love with this look u have created..so casual yet chic. Grt Going girl. You look lovely! White sure is the colour for you! My favorite looks so far.And yeah, I am quite addicted to polyvore myself too, so much inspiration going on cannot be missed. U know what kalyani, this is mera wala Yellow !! That’s a very decent pairing Kalyani. Polyvore is always a great inspiration corner for me too. But that tunic is much much beautiful than original. You look graceful. Loved ur combo… Yellow pants soon will soon be in my wardrobe fr sure!! Thank u lovely readers for your comments! 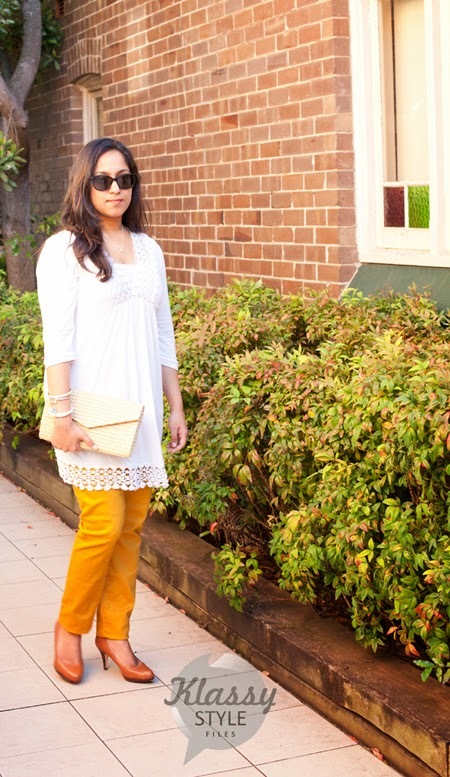 I love this look Kalyani, esp the tunic, very summery! The shoes are the perfect neutral accent to this look.